Today I went to hear my good friend Andrew teach Sunday School at Ebenezer Presbyterian Church. Dude knocked it way out of the park. So much so that I bought him pizza. (For those of you who're keeping score at home, that's pizza and beer for 3 consecutive days for me. There might be a problem that calls for an intervention. The pizza, that is.) Anyway, I was excited for a good excuse to bust out my new Bill's Khaki's Wool Donegal Limited Edition trousers. Ellie declared that they were "grown up without being 'old man'." Now, I'm no enemy of the old man look, but if what she said is true, sweet. 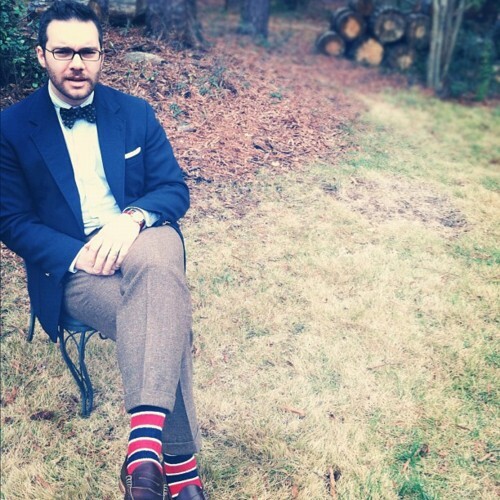 Ebenezer needed a mug of me for a conference at which I'm speaking there in March. Now, I'm usually pretty modest about being photographed, but for a good cause, I'll concede--but it won't be easy. 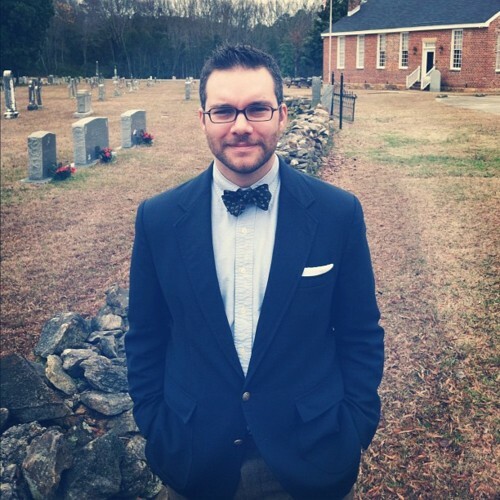 Figured I'd have Andrew snap a photo of me out in the churchyard. Remember churchyards? All churches used to have them. Especially ones that are 225 years old like this one. That building in the background is one of the oldest structures in the county. An old schoolhouse, I think. 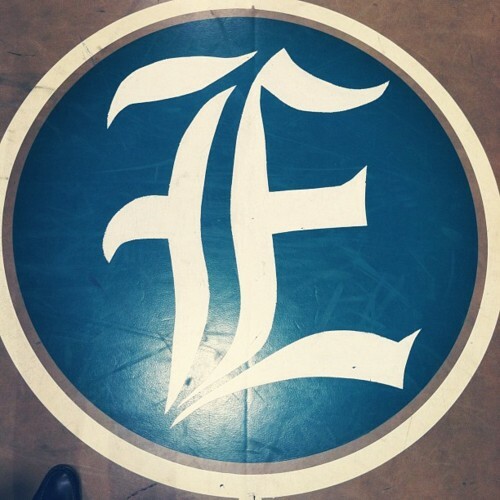 I really like the center court "E." You could play hoops in tweed and bow ties with an "E" like that on the court. 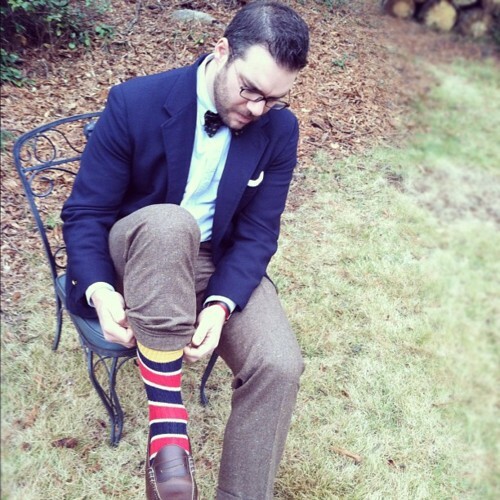 I've heard that there was a day when showing off one's socks was thought of as risqué. I guess because technically they're underwear. While I fully support the judgment that t-shirts are underwear and thus should not be worn (or seen 'peeking through') on the outside, I'm just going to go ahead and wear my foot-underwear for all to see, with the "go bold or go home" maxim being my guiding principle. 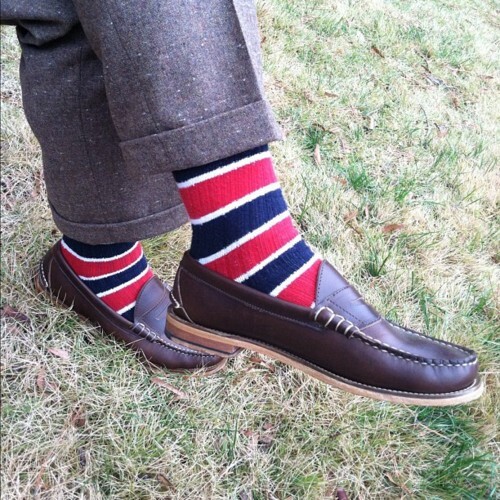 It's a great way to add a little punch to an otherwise understated ensemble. Or more punch to a what-the-heck-why-not ensemble. 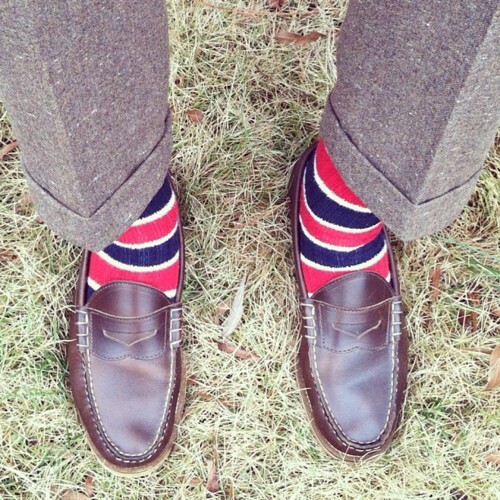 And of course, the socks seem to draw (at least my) eyes to my Oak Street Bootmakers penny loafers. George, the founder, said that the supple leather on these would stretch wonderfully to conform to my feet. They don't need "breaking in" like most leather shoes. They just kind of "make room." Love these shoes. 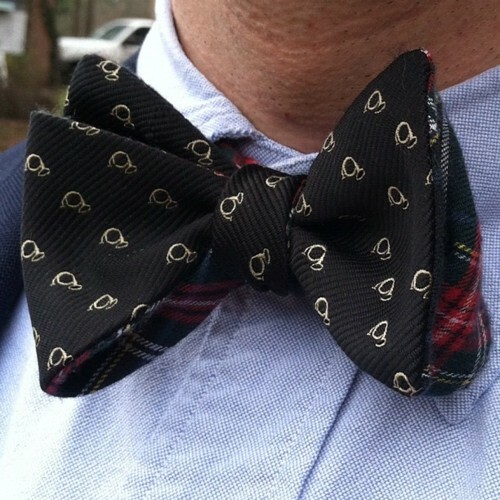 I'm looking forward to some photos of George in our bow ties now. This could be the beginning of a beautiful friendship. Okay, there you have it. 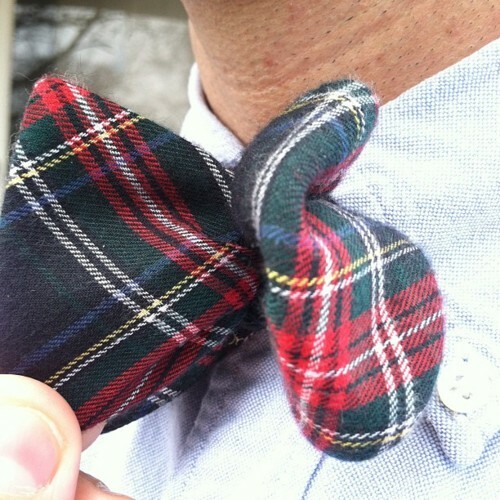 Run on over to the store and grab this one-of-a-kind bow tie before it's gone. All of it goes to kids in Haiti. Happy Sunday.